For those who obsess about steering feel and how it affects the ride experience, there is Angleset. Cane Creek created it so that you could change your effective head tube angle in order to get exactly what you want in terms of how your bike feels and performs under certain trail conditions. This AngleSet 1.5" Tapered Headset Kit - ZS49/EC49 is designed to fit bike frames with a straight 1.5" headtube -- 49mm ID on top and bottom. The external lower cup offers room for the oversize crown race of a 1.5" tapered fork as well. How does it work? It's simple really. The upper cup on Cane Creek's ZS49/EC49 Angleset Headset is available in three versions (included) -- .5°, 1.0°, and 1.5°. They have offset bearing bores (relative to the press-fit skirt) and can be installed forwards or backwards, yielding a total available angle range of 3° based from the centerline of the headtube. This means that if you're bike has a head tube angle of 68° this headset will allow you to make angular changes down to 66.5° or up to 69.5° or between those marks, depending on which of the three cups you install. Both upper and lower bearings are housed in gimbals that self-adjust for the angular correction so that your headset gets a perfect, clunk-free fit when you set it up. The benefit of the Angleset is that you can customize the steering feel of your bike exactly to your liking. Like their top-of-the-line 110 series headsets, the Angleset cups and gimbal parts are machine from 7075-T6 aluminum. 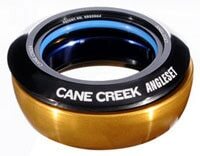 They use Cane Creek's black oxide bearings. The races and balls start out as 52100 steel and are then given an acid bath to make them more corrosion resistant, while still being porous enough to retain grease. They are angular contact bearings (ACB), which resist both axial and radial loads equally well. The cartridges are sealed with what Cane Creek likes to call a Split Lip Seal, which has two contact seals per side to better keep out contaminants and hold in grease. The Cane Creek AngleSet 1.5" Tapered Headset Kit - ZS49/EC49 is anodized Black and has laser etched graphics and dimensional specs on each cup. This is a headset that mates a fork with a 1-1/8" to 1.5" tapered steerer to a 1.5" headtube with 49mm ID top and bottom. It's also possible to use a straight 1-1/8" fork with a conversion crown race (sold separately).